You are here: Home / Frequently Asked Questions / How do I Pay my Lawyer? Ginsberg Law Offices represents work injury clients under a “no fee unless you win” contingency contract. Our contract provides that you will pay 25% of any settlement I can negotiate on your behalf. If your case does not settle, or if we lose, you will owe me no attorney’s fees. A contingency fee contract does not mean that I work for free. It means that I am of the opinion that your case is likely to generate a reasonable settlement. 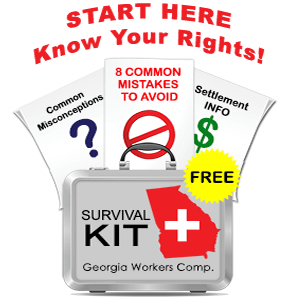 All fee contracts in Georgia workers’ compensation claims must be approved by the Georgia State Board of Workers’ Compensation. The fee contact I use is regularly approved by the State Board. Still, I urge you to read each and every word of my fee contact before signing it – if you have questions about how I am to be paid, please ask me. Georgia workers’ compensation law does allow claimant’s lawyers to take 25% of their clients’ weekly benefits. Except in very, very rare instances, I do not include this provision in my fee contract. In my view, it is hard enough for my clients to survive on $400 to $500 per week (typical weekly benefit payment amounts) without giving up 25% of that payment to their lawyer. At all times, I will provide to you zealous, professional representation and I will do my best to maximize your benefits under the Georgia workers’ compensation laws.